There is no better way to display your collectibles, keep your entertainment equipment, and simply organize your home than with this functional entertainment tower. With the top glass and bottom wooden door opening from right to left, you will have ample storage room. With three adjustable shelves, you can choose their position and actually fit all the items you need to store. The solid maple wood is combined with graceful profiled edges and tapered feet. The casual elegance of this piece will look flawless in your living room, family room, office, or any other space in your house you need extra storage room and a charming accent. The Tribeca Left Side Entertainment Tower with 2 Shelves by AA Laun at AHFA in the area. Product availability may vary. Contact us for the most current availability on this product. 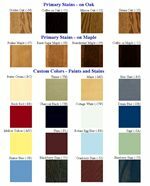 Finish Choose your Custom Colors, stains or paints, and the finishing options all stain, all paint, or various combination of stains and paints, standard or deluxe. The final creation is then truly a one of a kind selection, finished by our skilled craftsmen. Case Detail Corners and edges will be softened and slightly distressed, providing a warm and comfortable "time worn" feeling. Sleek tapered feet and straight clean edges. Drawer / Shelf Construction Authentic English dovetail drawer boxes and Premium slides (PS). Description: Top Generous 6/4 inch solid maple tops. Whether in the city or the countryside, Tribeca has that feeling of casual elegance that is at home in either setting. The natural beauty of Tribeca is enhanced by the lustrous finish of solid maple. Generous 1.5 inch solid maple tops are combined with graceful profiled legs and nicely scaled drawer fronts. The brushed nickel hardware finish off the look for each piece, creating idyllic detail that will look great on any finish. Each piece from the Tribeca collection is also available in all the Custom Color stains and paints to further accommodate your personalized style and the decor of your home. Complete your living room, family room, den, entertainment room, or any other place in your home that needs a sophisticated accent with the occasional pieces from this collection. The Tribeca collection is a great option if you are looking for Casual furniture in the area. Browse other items in the Tribeca collection from AHFA in the area.